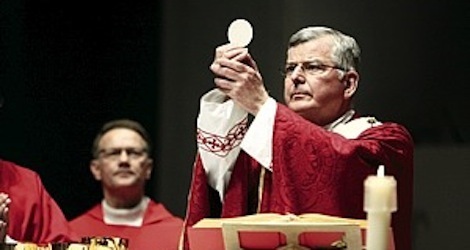 I am sorry to report that Archbishop John Nienstedt, former spiritual leader of the Archdiocese of St. Paul-Minneapolis, has left his temporary position assisting an ailing priest in Kalamazoo in the face of mounting pressure. Bishop Paul J. Bradley of the Kalamazoo Diocese issued a statement later, saying he regretted not understanding the “emotional reaction” created by Nienstedt’s arrival. So it is over. The social activists of SNAP may gloat over their apparent “victory”; but parishioners will be deprived of the excellent homilies and faithful witeness of this holy man of God. Please continue to pray for Archbishop Nienstedt and for all those who serve our Church faithfully regardless of the potential consequences. Pray, too, for those who have been abused, for the abusers, and for those–like the members of SNAP–who wear their victimhood like a badge of honor. I guess the “Catholics” in Kalamazoo, and the cretins at SNAP, must have missed the memo that this is a Year of Mercy, decreed by Pope Francis.